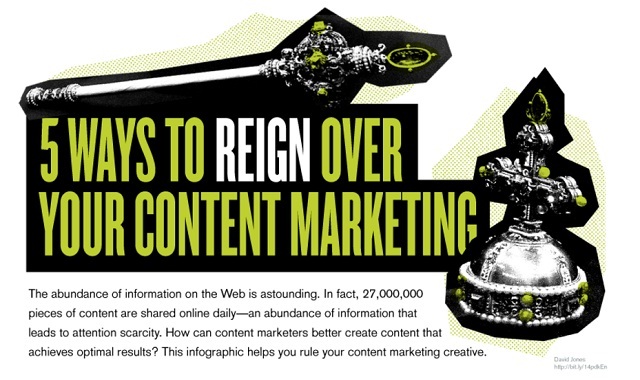 5 Ways To Reign Over Your Content Marketing #infographic ~ Visualistan '+g+"
As content marketers, we know about the abundance of information out there. When creating content you want to be heard passed the noise and want your content to be both engaging and relevant . But unfortunately many content marketers aren’t achieving optimal results when pushing out their content. In this infographic, we will examine how to get passed the noise and reach the right people by giving them insights and data, getting visual, being everywhere, and tugging those heartstrings. Reign over your content marketing today!